One of the most enchanting things in today’s age is the ability to seek unto a divine freedom of the soul! Many men and women, dream of the clarity that they pursue time after time, especially because they don’t get it in their daily lives. While others, mostly travelers find this aspect of life to be an endless journey. One that is full of clairvoyance, meaning and clarity that others can only imagine. And what better than the traversing of the mountains, wandering across the horizon to find serenity in nature and introspect, take a peak in your pondering mind. Traveling across the mountains without a clue, without a reason and without connectivity, especially to the rat race that we all take part in on a daily basis. That’s a true reason why I always enjoy hiking, especially in the Himalayas, but even if I’m not in the Himalayas, walking across any mountain range gives me immense pleasure. One that you can only find when you surrender yourself to the unknown trails, paths, like your destiny that lead you to a mesmerising sunrise, or an enchanting sunset! Traveling across the beauty of organic and natural surroundings without any worldly worries. That’s something that I yearn for, especially when I want to detox, unwind and just completely disappear into the wilderness. Sometimes I even feel there is a dire need for me to go back into complete dissonance of technology. One that’ll help me attain a nirvana of sorts. I wonder how beautiful every single day would be, with just the nature, a few books, okay maybe a Radio at best to give me company. Imagine the joy of visualising your dreams, settling down and farming on a hilltop, viewing and experiencing the pleasure of sunrise and sunset without having to run for a meeting and or thinking about deadlines! Someday, that day will arrive soon! Until then, I keep meandering across the world finding the sweet spot, the balance of life between my travels and my work. And it is these mountains that always help me rejuvenate and revive my spirit within, to get back to the grind that will eventually help me get to that ‘Someday’ I’m looking for. 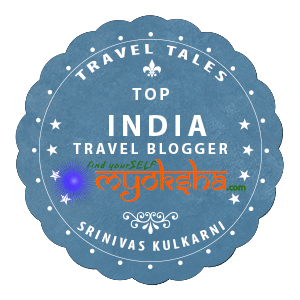 This entry was posted in Travelogues, Stories and Life and tagged Blogging, Digital Age, Digital Detox, Farming, HIking, Hilltop, Himalayas, India Travel Blogger, Indian travel blogger, Mountaineering, Mountains, srinistuff, srinivas kulkarni, Trekking on February 12, 2017 by srinistuff.